Vision Wide Tech was established by industry expert and specializes in the development, production and sales of high efficiency machining centres for many years. We focus on the field of double column machines and have become a world's leading and renowned manufacturer. 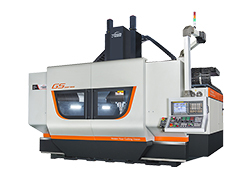 Gantry type Machining center GS series is particularly designed for precision mold and aluminum cutting industries to meet their requirements at high speed, high accuracy, high efficiency, and mess chip removal. The powerful spindle for aluminum cutting at high acceleration /deceleration improves efficiency at 3D mold cutting. If you are looking for high efficient, high accuracy and durable gantry type central machinery or other machining centres, you can count on Vision Wide Tech. Any suggestion, question or commentary regarding CNC machining, please don't hesitate to submit them to our Customer Service Center.